Senior forward Kayla Gibbs recorded her 9th career double-double against the University at Albany. (Courtesy of UMass Lowell Athletics). 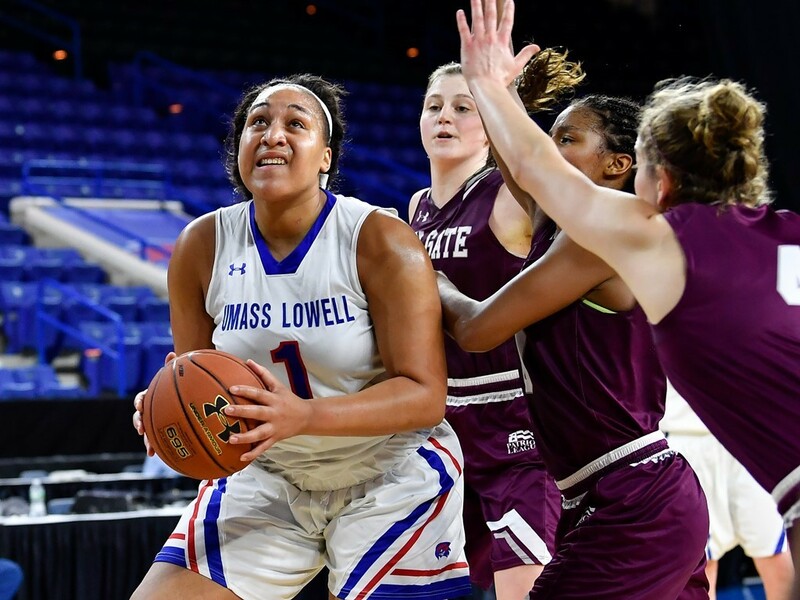 It was a tale of two halves for the UMass Lowell women’s basketball team who lost their ninth straight home game at the Tsongas Center 61-52 despite leading the University at Albany Great Danes 32-23 at half. Even with senior forward Kayla Gibbs’ 9th career double-double, the River Hawks fell short of a victory. UAlbany, the 2017 America East tournament champions, came into the game with a 4-game win streak, a 4-1 record in the conference and a 15-3 overall record, while UMass Lowell was winless in the conference and were 3-14 overall. UMass Lowell began the game with high energy and a physicality on defense, especially in the paint, resulting in a 6-0 run to start the game. The River Hawks’ defense did a spectacular job of crowding the paint, thanks to the senior duo of junior guard Brianna Rudolph and Gibbs, forcing the Great Danes to either force a lay up or shoot from outside the three-point line. UAlbany missed their first 12 shots. UMass Lowell head coach Jenerrie Harris gave full credit to the players for the way they started on defense. On offense for UMass Lowell, pass and move was the name of the game. Quick passing and movement off the ball opened passing lanes for Gibbs and Rudolph inside the paint. UAlbany’s man-to-man defense was vulnerable a majority of the first half being drawn out by the River Hawk’s perimeter passing. Freshmen guard Paula Lopez played with high intensity and composure, making multiple key passes in the first half. UMass Lowell led the entire first half of the game and UAlbany didn’t have many answers until the second half. UMass Lowell’s pace fell off, and in the third quarter UAlbany took their chances and capitalized on the high amount of turnovers UMass Lowell was giving up. The River Hawks had 10 turnovers in the third quarter. UAlbany outscored UMass Lowell 16-4 and engineered a huge momentum change in the game. Eventually, UAlbany built off the momentum swing and UMass Lowell could not respond. UAlbany took their first lead in the last seconds of the third quarter and never looked back. The Great Danes went on a 9-0 run in the final two and a half minutes to close out the game and earn the victory. Harris also said the number of turnovers in the third quarter was the key indicator that turned the game in favor of UAlbany. The River Hawk team showed they can compete with the top teams in the conference despite not putting up a conference win this season. Lopez’s confident play, and Gibbs’ presence in the paint means they’re still a team with an offensive threat just waiting to click. “They’re continuing to learn, and only five games into conference, our goal is to just want to get better every single practice and every single game,” said Harris. The River Hawks return to action on Sunday, Jan. 21 when they host Binghamton University at 12 p.m.